When you think about what you are saying and how it could be misread and misinterpreted, you can align ... Más informaciones your message to reach the most people the way you want. Podcast Blog Supplement for Episode 59 of the Wait What Really OK Podcast with Loren Weisman. 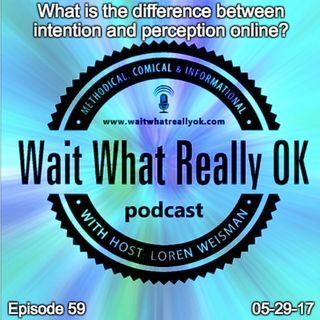 Podcast Link Supplement for Episode 59 of the Wait What Really OK Podcast with Loren Weisman. How does arguing online hurt your reputation offline? Podcast Video Supplement for Episode 59 of the Wait What Really OK Podcast with Loren Weisman. Podcast Photo Supplement for Episode 59 of the Wait What Really OK Podcast with Loren Weisman.